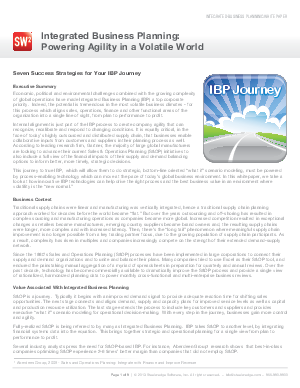 Integrated business planning aligns demand, supply and finance plans for a clear line of sight across an organization. With this complete view, businesses can test the financial impact of different “what if” options in the supply-demand continuum in response to global marketplace volatility and changing customer demands. This paper outlines seven success strategies for maturing your Sales & Operations Planning process toward full Integrated Business Planning.